I want to report a rather major bug. Not sure if you’re aware of it, but I wouldn’t be surprised, just saying in case you weren’t. The scene shortly before the route split happens, when the bad guys crash the ceremony, the game softlocks when the enemies attack the NPCs. I looked into it and looks like they’re attacking units who aren’t fielded … I think. It’s been a week already, but you’ll see when you check. Also, was making longbows locked to archers and snipers intentional? Because they’re still a lot of generics running around with longbows, like warriors and silver knights. The softlock should be fixed. Longbows are supposed to be infantry only. Hm, well that one warrior in Owen’s first chapter certainly couldn’t use the steel longbow, I remember that much. I got 2.0 when it was released, so unless you fixed it in a later update, I’m afraid it’s still there. Yeah it’ll be fixed next update. Speaking of the point when Oberon’s forces jump out and are supposed to attack Belle’s guards during the ceremony, for some reason one of them (from the way it looked on the screen) teleported into the wall and killed Nero instead of one of the guards. Look and behold, I start the roit split, and Nero is dead. I have no understanding of what happened beyond that. That’s what happens whenever it doesn’t softlock, anyway. If the softlock occurs, Nero remains alive. It’s finally time for Ganzap the Disgustang to play SoA!!! I just recently started playing and I really enjoy it. Something I’d like to know though, is all of the custom music original or taken from other games? 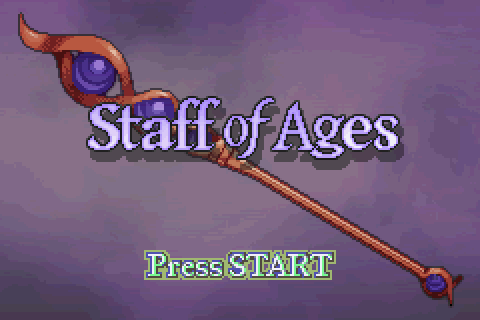 It was supposed to be the Staff of Aegis but the localizers goofed it. e: check my flair, I know these things. Damn. The SSB localizer bandits strike again. Haven’t yet played staff of ages, and this sounds awesome! I’ll be sure to check it out. I’m hoping there won’t be bugs but there’s probably going to be undiscovered bugs still because that’s just how this seems to go. If we end up needing more time I’ll update things accordingly.